Last night, I was hanging out with some friends, and it came up that my friend Will’s birthday is in a few weeks. It falls on a Wednesday this year — the middle of the week. Mid-week birthdays are hard to celebrate properly unless you can take the day off, or you have a really motivated group of friends who wants to plan something fun that night. Everyone is working the next day, so evening festivities must be kept to a minimum. Enter the “Special Lunch.” During a busy week, for all the reasons above it’s hard to schedule something fun. So, why not enjoy something a little bit different, a little bit special, a little bit decadent for lunch during the workday? Most people are probably going to run out at the noon lunch hour to grab something anyway, so why not kick it up a notch? Well, apparently not everyone shares this view. When I made this suggestion to Will and our friends last night, I was met with stifled giggles and empathetic looks, albeit kind ones. Everyone agreed that a “Special Lunch” was an “Annakate thing,” and not something everyone could get behind. It was as if they all thought I was from another — foodier — planet. To that, I must take a stand. I really don’t think my suggestion was unreasonable. Now the “Special Lunch” doesn’t have to be something over-the-top, like a three-course lunch with wine pairings from Capitol Grille downtown, or to a favorite restaurant all the way across town (although, I for one, think both of those would be wonderful excursions, and totally acceptable reasons for a somewhat prolonged absence from the office on your birthday). The “Special Lunch” could be as simple as getting extra bacon on your sandwich at your favorite take-away place, or a milkshake with that burger instead of the typical diet cola. Doing something a little bit exotic or outside your daily routine, and taking the time to enjoy it, makes the day seem special, even if it’s just a small modification to something you’re already doing. Am I wrong? I really think it’s a cut and dry issue. I can see that some may find this hard to swallow at first, but I’d encourage them to really think about it! Why not? We all have to eat, so we might as well eat well. That’s something my first boss, Brenda, taught me, when I worked for her at a boutique food-focused PR agency in Chicago, and I find myself saying it often. Eating and enjoying good food is something we all should take more time to do. The stand-up dinner, the breakfast in the car — totally lame. But unfortunately, in our fast-paced, digitized world, taking time to really enjoy a meal isn’t always possible. But when you do take a little extra time for yourself — like on a birthday — you might as well fill that time doing something enjoyable like treating yourself to a nice meal, just because. So there. 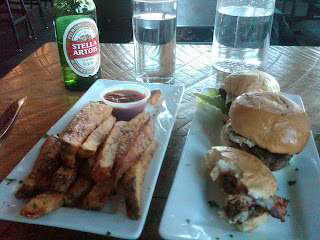 At this very moment, I’m sitting at Burger Up, a lovely little joint in Nashville, enjoying a trio of sliders, some of their famous fries, and a beer — a beer! — for my lunch today. It’s not my birthday, but I took the day off just for fun, and I felt something special was appropriate. I’m sitting here with good music on the stereo, interesting people walking by, a really delicious lamb mini-burger with arugula and Dijon on my plate, and I can’t tell you how much I’m enjoying it. So with that, I challenge all the readers of this blog — including you Will! — to go out and get themselves something special for lunch sometime soon — even if it’s as simple as asking for extra pickles at your favorite fried chicken place. I bet you won’t regret it. I’ll treat you to lunch if you do. I'm all for Special Lunch! 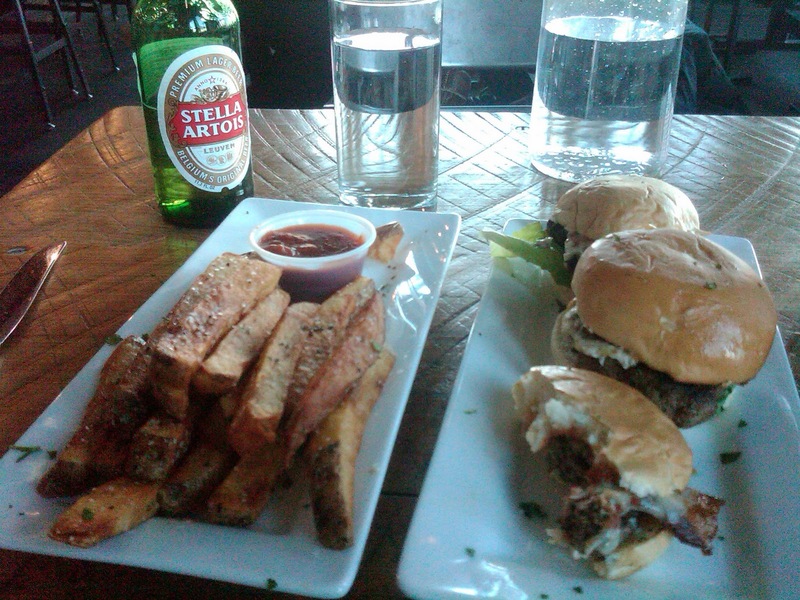 Especially at Burger Up, yum. We get our birthdays off at my office, but I usually opt to take a different day instead and enjoy a day full of treats! AK, this idea is fabulous, and one I've indulged in many a-time. I rarely eat out, so treating myself to something other than leftovers for lunch is always a good way to celebrate, and to break up the workday with some well-earned pleasure. Also, I love reading your blog. Can't wait for more of your special Annakate ideas and suggestions! I'm totally on board with the Special Lunch idea. I also tend to think that no matter what I'm eating — even if it isn't particularly special (as my lunch, at this moment, consists of a pb&j; sandwich) — it is always more enjoyable when I take them time to focus on eating it (as opposed to the stand-up dinner, breakfast in the car, etc etc). Great ponderings! Love your blog.